Canterbury Robotics team members prepare their robot to compete. Left to right: Erik Stedman ‘20, Misha Verozub ‘19, Cameron Krinsky ‘21. Drop off a marker and place it in a certain spot. Sounds simple—that is, until it must be performed autonomously by a robot. The goal is simple, the possibilities are endless, and the Canterbury Robotics team is ready to take on the challenge. Robotics Club meets every day as a sports alternative. Mr. Kennedy is the advisor, and eight students participated: Mike Shi ‘21, Erik Stedman ‘20, Misha Verozub ‘19, JiWon Lee ‘20, Cameron Krinsky ‘21, Alex Kolonchin ‘21, Brendan Clark ‘20, and Pluem Artkaew ‘19. The robot itself was made of metal rods and parts, motors, and wires. One exciting feature is its “omni wheels”, which allow it to move in any direction. In total, the bot takes up 18x18x18 inches. The team participated in three competitions: two qualifying rounds and the States. In the qualifying phase, Canterbury placed in the top four and moved on to States, where they ranked 14/28. 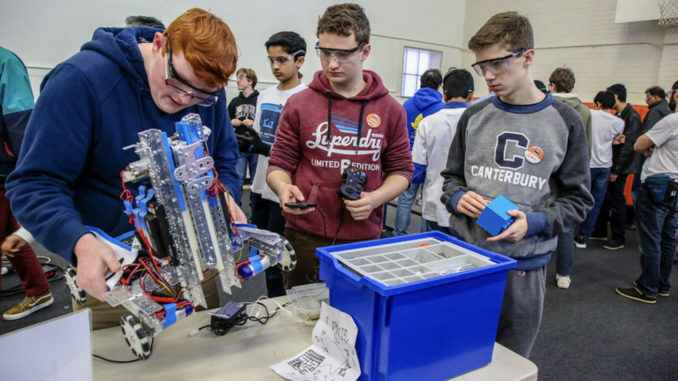 In a robotics tournament, teams are tasked with designing a robot that can complete any number of tasks off a predetermined list. Each task is worth a different amount of points. To maximize points, the robots must have a variety of working functions. The Canterbury team decided in advance to pursue the highest-valued tasks that actually seemed feasible. As long as it completes the tasks, everything from the material it is made of to whether the programming will translate properly to the real world is up to the team to figure out. Robotics materials can be expensive and hard to modify without laser-cutting and high-tech machinery. Therefore, designing the most effective robot possible with the time and materials at hand—especially without a full playing field to practice on—was the tall order given to these young engineers. 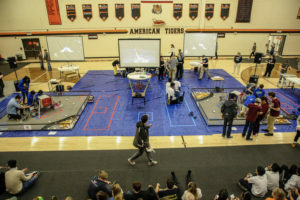 The playing field of a robotics tournament. round teams are randomized into groups of two “alliance partners” whose point totals are summed together. After five 2v2 rounds come the finals, in which the top four teams select two other teams apiece for alliances and then face off in a final challenge. First in the tournament was the autonomous section, in which the bot performed tasks based on extensive programming done by Pluem Artkaew in advance. After lowering itself onto the playing field from a lander, it dropped off a marker 3D-printed by Mike Shi. It then parked successfully in a crater. Once this was complete, the competition moved into the controlled phase. Misha Verozub guided the robot via a controller to push spheres and cubes to certain areas on the playing field and accumulate more points. The bot ended its run by pulling itself back up onto the lander. The most difficult task to program ended up being the robot pulling itself back up at the very end. However, the team proudly recounts how they managed to overcome this challenge and fix the function after the first few rounds. As they pursued this challenge, the team recorded their journey in an engineering notebook, containing bios of each member and their notes on each step of the project. At the competition, teams had a chance to reflect on their growth by presenting this book to a panel of judges. After a short interview, these judges can vote through teams that didn’t achieve the necessary points but proved themselves through community outreach. The Canterbury team did not pursue this angle due to time constraints, but looks hopefully to next year. Still, Misha, Erik, and Pluem agreed that engineering and building a robot from start to finish was a fascinating process. In fact, Pluem is interested in programming in the future and feels that the chance to get experience as main programmer on this project was very worthwhile.